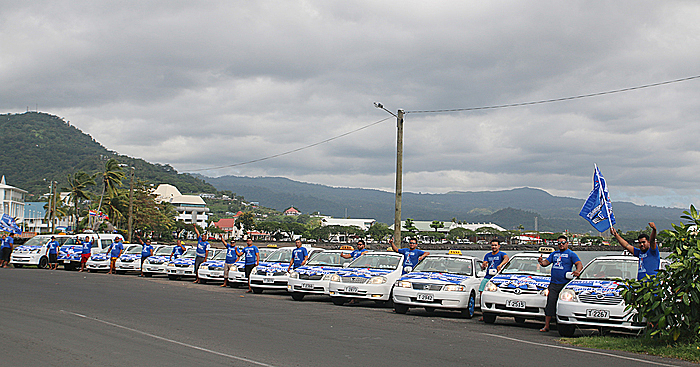 There was a sea of blue yesterday in the town of Apia with every taxi and driver from the Magik Taxi Stand at Matautu all in their blue uniforms yesterday. The idea was to show their support for our boys in blue as they prepare to go into battle with the Ikale Tahi this afternoon. The President of the Magik FM Taxi Mr. Malo said this is the first time they’ve done something like that. Mr. Malo said each taxi driver had to buy their own t-shirts and banners but it was compulsory for all to wear blue. “We are so happy that everyone welcomed the idea because it shows that our hearts are with our boys in the Manu Samoa team.